Hey guys! If you haven't already heard, I want to let you know about the new photo link up I'll be hosting here each week starting tomorrow. A photo link up where you can post any photo you want - portraits, macros, candids, still life, landscapes or whatever you come up with each week. So there will be no themes... just lots of awesome photos! The linky will open every Thursday morning and remain open until Saturday night. 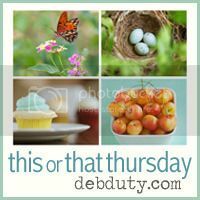 Since you can link up whatever you'd like, I came up with the name This or That Thursday. I even made a button. So grab the button code and come back tomorrow to link up your photos! That's it! See you tomorrow! And be sure to check out My Reflection of Something today for the edit me challenge. I'm the guest judge this week and I can't wait to see what everyone comes up with for my leaf photo! Way to go girl! The button goes along with the theme perfectly! Sounds like a great idea Deb, looking forward to it. Good for you, Deb!! :) I look forward to jumping in! I love the idea and a great name. Looking forward to the inspirations to be linked. Looking forward to linking up! Can't wait to see everyone's photos! Yay - can't wait...I'll be linking up late since I have good to Wow to go first. YAY! I can't wait! Adding your button to my blog now! This will do well! That sounds awesome Deb- I'll be here tomorrow! I love the button you made for this! Thanks again for allowing me to use my archives! :-D I'm off to the edit me challenge! Oh Deb, I'm so excited!! Can't wait to link up tomorrow. i will be there... so fun!!!!! Congrats on your new venture! I'll totally be back to link up once school lets out for the day! Ill be linking up too! Cant wait. This is so nice - I cannot wait and have forwarded the info on to a few friends in hopes they'll participate, too! Great idea! Thanks for the opportunity to join in! Oh this is wonderful! And your button is awesome! I'm excited to link up - YAY! !